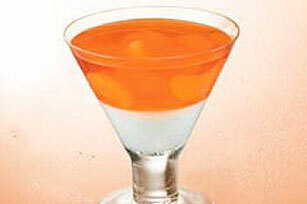 Cottage cheese gets blended to form a smooth bottom layer for this orange JELL-O dessert with mandarin slices. Place cottage cheese in a blender or food processor container; cover. Blend until smooth; set aside. Stir boiling water into gelatin in medium bowl at least 2 minutes until completely dissolved. Add enough ice cubes to cold water to measure 1-1/4 cups. Add to gelatin; stir until slightly thickened. Remove any unmelted ice. Stir in orange segments. Divide cottage cheese evenly among 8 individual dessert dishes. Spoon gelatin mixture over cottage cheese. Refrigerate 2 hours or until firm. Prepare as directed, using your favorite flavor JELL-O Sugar Free Gelatin.